At only five years old, Kayleigh Lastorino has lived a full life. Kayleigh’s biological parents struggled with drug and alcohol addiction, and Kayleigh was quickly put into foster care and later adopted into a loving home filled with eight siblings. She has spent her short life in speech, occupational and physical therapy but still struggles with major anxiety and other mood disorders. “Her start in life was hard and since then, there has not been much relief for her,” says her adopted mom, Melissa Lastorino. Her anxiety and additional mood disorders leave her unable to cope with her daily surroundings which has caused her to inflict pain on herself. Kayleigh’s psychiatrist suggested the family look into a service dog to help regulate Kayleigh’s mood disorder and to interrupt any self-harming behavior. After years of therapy and medication, Kayleigh and her family were more than open to a new idea. “We knew we needed this dog to help make life livable for Kayleigh,” says Melissa. Service dogs can be incredibly effective for a child with psychiatric disorders, but the price tag prohibits many from benefitting from their services. Melissa and her family held countless fundraisers to help with the cost of both the dog and the training, only to come up short. Variety stepped in to cover the remaining $5,000 balance so that Kayleigh could have a protector in her life. 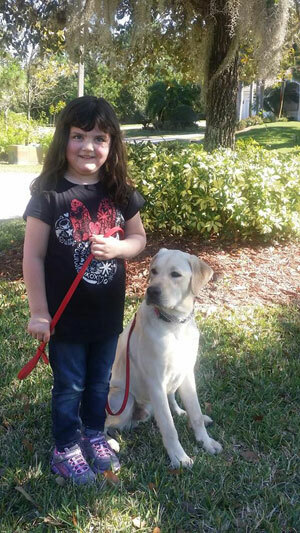 It was love at first sight when Kayleigh met her service dog, Thaddeus. There was an immediate connection that overwhelmed Kayleigh and her family to the point of tears. Thaddeus has spent months in intense training to become a service dog and continues to learn the specific behaviors of Kayleigh. “There is nothing more satisfying than seeing your child get comfort, security and emotional support that this dog has provided for her,” says Melissa. Kayleigh’s life is forever changed for the better because of Variety of Texas.